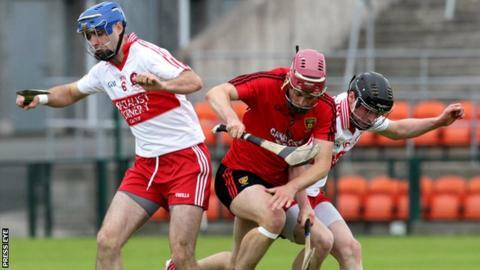 Holders Down, Derry and Armagh were all beaten in the first round of the Christy Ring Cup on Saturday. Down lost 0-17 to 1-8 against Meath at Trim while Derry were hammered 4-31 to 0-11 by Kerry at Tralee. The two Ulster sides will now clash in round 2B of the competition, which also sees Armagh have home advantage against Wicklow or Kildare. Armagh were defeated 0-20 to 0-14 by Mayo at Castlebar while Tyrone and Monaghan lost in the Nicky Rackard Cup. The Red Hands suffered a 2-21 to 1-27 extra-time defeat by Sligo and Monaghan lost out 2-15 to 0-9 against Roscommon. Derry trailed 2-18 to 0-10 at the break after goals from Shane Nolan and Colm Harty while Daniel Collins and Mikey Boyle netted in the second half for Kerry. Alan Grant, Kevin Hinphey and Ruairi Convery were among the Derry scorers in Tralee. Down will host the Oak Leafers in round 2B with dates, times and venues to be confirmed on Tuesday.